MiniBrew launched their iteration of the automated brewing system into the market. The MiniBrew did its due diligence and improved upon some of the pitfalls of its predecessors that we covered in our original overview of automated brewing systems. The MiniBrew started similar to how many other automated brewing systems get initial income, through a crowdfunding campaign. Their Indiegogo campaign began in November of 2015 and reached 125% of its original funding goal. Like most automated brewing systems, it resembles a large, amped up coffee maker. The unit has a hopper on the top for grain and a smaller compartment for hops, and the system brews 5 liters of beer, or a little over a gallon. Recipe selection is actually very revolutionary, especially for those not familiar with the dozens of beer styles available. Instead of searching through recipe kits, you use what they’ve termed the “beer compass” to help you find the right recipe kit for what you’re looking to brew. Simply slide desired flavor, alcohol, and color sliders to your desired levels. As you do, the app generates a list of potential styles, and how well that style matches to your selected preferences. As of yet, there’s no price range for what each recipe kit will cost, or what styles will be available at delivery. The app will also allow you to control fermentation temperature and other brewing aspects, However, there is no word yet on if you can create custom recipes. Once the brewing process is complete, you detach the keg (which also serves as the fermenter) from the brewing apparatus and plug it in to control fermentation temperature. The MiniBrew does not require a separate unit to control the temperature. Each specialized keg has the cooling device built into it. After the fermentation has completed, you can drop the temperature down further to your desired serving temperature and you’re ready to go. The keg also has a handle for easy transportation wherever you need your homebrew to be. To serve, all you need to attach is a faucet to one of the keg’s disconnects. This automated brewing system brings a lot of innovation to the table that other systems should take note of. 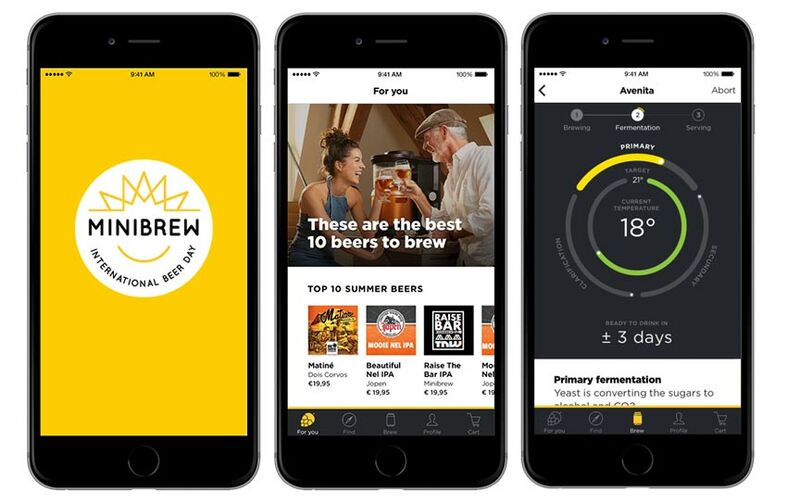 The Beer Compass app is a great tool for those looking to learn more about beer, and brew those styles easily in their kitchen. Being able to take your serving keg on the go is another key benefit. If you do haul your beer to a friends house, throw the keg in the fridge for an hour or two before serving to help the sediment settle back to the bottom of the keg. While pricey, the fermentation kegs each have their own cooling device and serve directly from the fermenter. This is great for brewers who want to have several styles on tap at once, or who desire to brew more than 5L at a time. Simply detach the keg after brewing, and brew another keg right after the fact. This opens up a lot of options to the brewer. For example, one could brew a wheat ale, and follow it up with a style that requires more aging time, such as a barleywine. This brings me to something that is less of a con, and more of a buyer-be-“knowledgeable”. 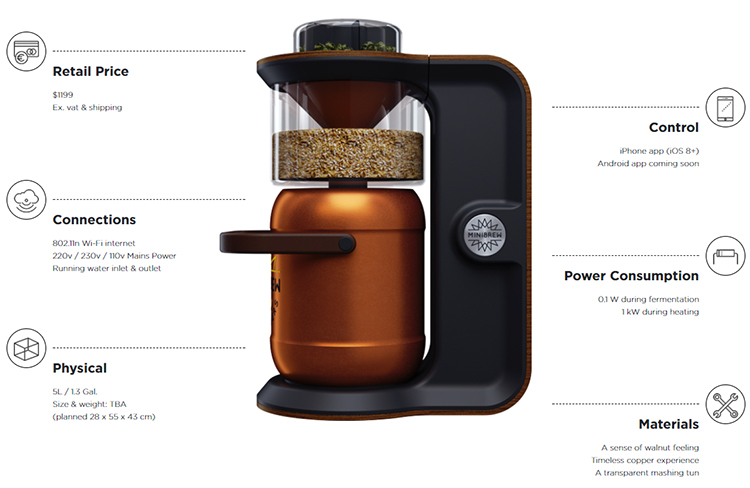 The MiniBrew advertises brewing beers from start yeast pitch to serving in as few as four days. You can read more about how you might not want to heed that marketing advice in our article on brewing your best beer on automated brewing systems. 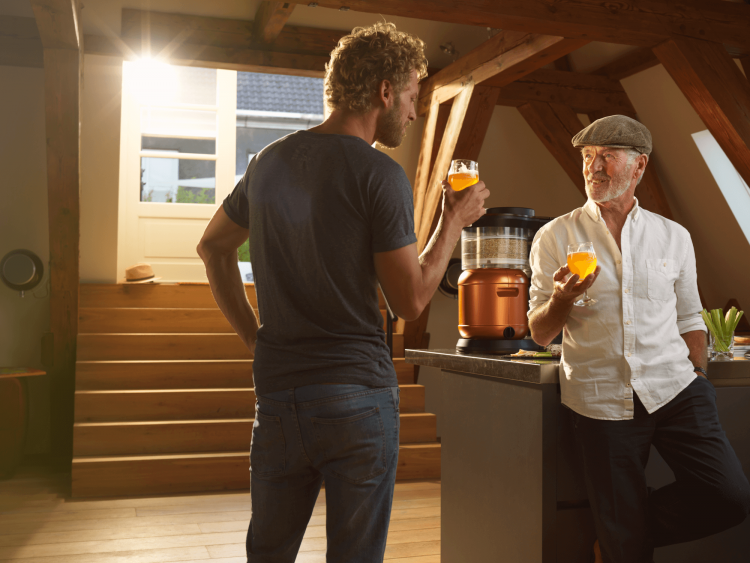 Like many automated brewing systems, the MiniBrew lets you serve directly from your fermentation keg. While this is a benefit in some regards (not tying up your countertop brewing system), the beer will be sitting on a pile of sediment which can make the beer cloudy if it gets shaken back up into the beer. The other downside of the system is a potential lack of customization in the recipes. By having to scan a brewing schedule from a recipe kit, you’ll be limited to whatever recipes they offer. 2/12/18 UPDATE: What started out as a con in this article, actually ended up turning into a pro. MiniBrew will actually have two separate methods for brewing ingredients. For the launch, you are able to use only the ready-to-brew Ingredient Packs from MiniBrew (these are great for beginners). However, the team is also currently testing the pro version called The Brewery Portal which will enable more advanced brewers to experience full flexibility and controls in the creation of recipes and flavors. That being said, the MiniBrew provides plenty of new things to the automated brewing system market that we should see expanded on in the future. If you’re looking to brew 30-60 glasses of beer per month, in a few different styles, the MiniBrew should be an excellent option for you. Honest reviews of innovative brewing technology. Brewfuse.com is a participant in the Amazon Services LLC Associates Program, an affiliate advertising program designed to provide a means for sites to earn advertising fees by advertising and linking to Amazon.com.